This site give will give you information about European banks and risks in the bank sector. 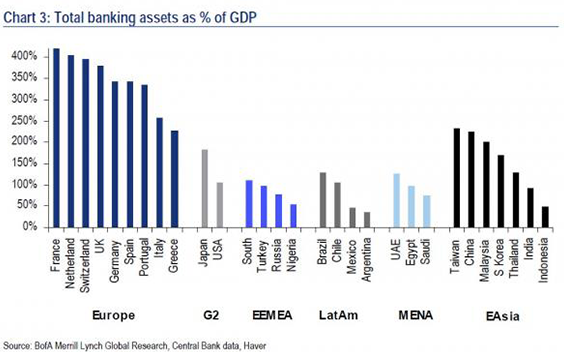 Compared to other parts of the world the Europe’s banking sector is over-sized in relation to the GDB. The euro area will remain in recession in 2013, with activity contracting by over ½ percent according to IMF. Growth will rise to just under 1 percent in 2014. The ECB came with a forecast 8th of August 2013, turning down GDP forecast to minus 0.6% in 2013 and they are predicting GDP 0.9% in 2014. European banks have a stock market value of only 70 percent of what their assets alone are worth, according to central bank figures according to an article in New York Times dated 29th of September 2013. EU finance ministers are trying to agree on rules how troubled banks will be phased out and how the the bank union will prevent banking crises. Most likely there will be more discussions on the next meeting of finance ministers in July 2013.